At the Office for iPad debut, Microsoft revealed it is using the so-called "freemium" sales model with the suite of productivity apps. In the case of Office, users can download the software for free, but will need to stump $99 per year (or pay a recurring $9.99 per month fee) for a Office 365 subscription if they want to edit documents. In a statement to Re/code, Apple confirmed it will take the usual 30 percent cut of all Office 365 subscriptions purchased from any Office for iPad app. Apple does not profit from customers who use an existing subscription, or purchase a new subscription from Microsoft's website, to access the Office apps. Apple's charge to publishers for all in-app sales was thought to be one of the major roadblocks in Microsoft's launch of Office for iPad. Microsoft on Thursday introduced the long-awaited Office productivity suite for iPad, which includes custom-built versions of Word, Excel and PowerPoint. 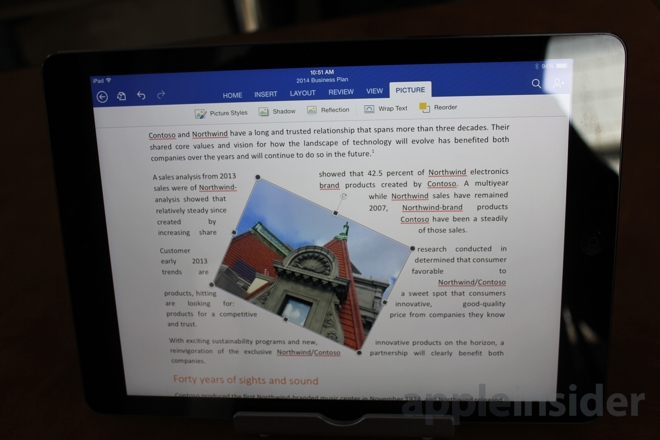 AppleInsider was able to spend some hands-on time with the new offerings and came away with the impression that Microsoft made a concerted effort to make the apps feel native to iPad, not just a mere port of existing software.